This week I went to my first event at the Storefront for art and architecture. This place is worth its own post (coming soon! ), but first, let me tell you what I learnt there about Korean architecture. 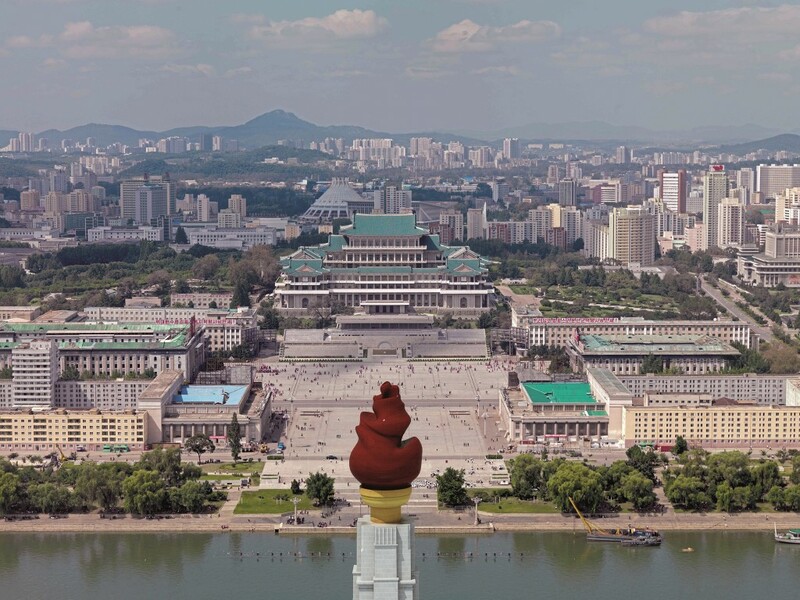 “Reading Images: Crow’s Eye View” is a reflection on a series of images from “Crow’s Eye View: The Korean Peninsula”, an upcoming exhibition that reprises work from the Korean Pavilion at the 2014 Venice Biennale of Architecture, which was awarded the Golden Lion for Best National Participation. This event is part of their Reading Images series and marks up the beginning of a new set of events about Architecture of Conflicts. The idea of the event is for each speaker to show a few images of Korea to talk about their experience of the country and its conflicts. 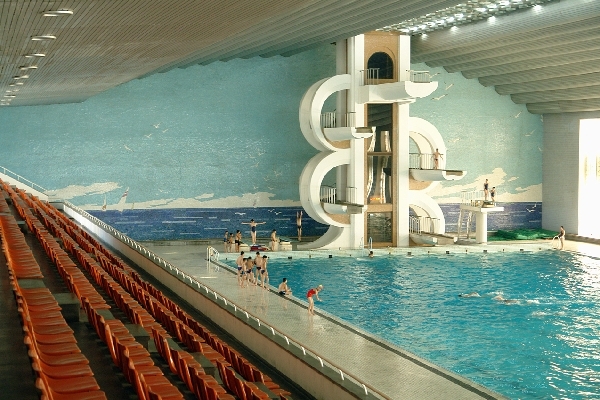 Based on nice colored drawings, founder of Koryo Tours Nick Bonner tells us about North Korean society and architecture. In terms of international relations, there is an anti-Japanese background since their occupation (1910-1945), and more recently an anti-American movement too. Korean architecture was originally more influenced by Russia than it was by China.Most of buildings are made of reinforced concrete. Korean architecture is self reliant, that is relying on North Korea only, just like the main religion of the country is based on the concept of individual self reliance. There has been no architectural influence from the rest of the world for many years. 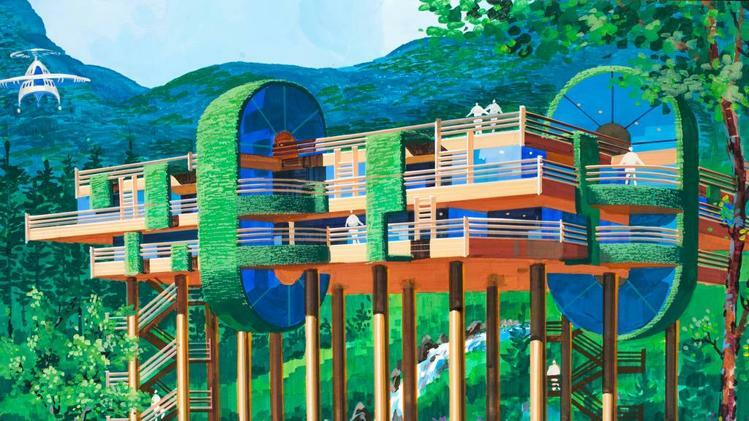 When Nick Bonner launches a call for entries about “the architecture of the future” in Korea, here is one entry. When asked about the opening of the country, Nick Bonner says taht nothing is changing, really […] no one is pro-change. The only way this self-enclosed country can change is by soft power. The tiny amount of money people have in their own pocket to buy things they want is what can bring new products to the country. On the behalf of photographer Alessandro Belgiojoso – who couldn’t make it, Hyungmin Pai shows a picture of the boundary between North and South Koreas (see below). The main difference between North and South Korea is its relation to the rest of the world. As for his own work, Hyungmin Pai was originally working on a book about Korea. But an exhibit for the Korean Pavilion in Venice? How to present a country we don’t know? Thus they conceived an open exhibition, a conversation starter, with no first intention, with no embedded message. It is just a collection of the documents he had for the book. Dongwoo Yim invites us to look at what Korea wants to show us. With the images North Korea broadcasts about itself (like the image below), we can learn a lot about what matters to the country officials, how they see themselves and what are their values. Kim Il-sung Square, Pyongyang, photo by Philipp Meuser. Marco Bruno is an Italian architect practicing in South Korea. In Seoul, he was amazed by the public space, and how people make a full use of it. In this context, he noticed a thin line between legal and illegal. As for Yehre Suh, she is into maps. There is an inherently codependency/coexistence relationship between North and South Korea. Beyond the exotic imagery of North Korea, the pavilion managed to also talk about the everyday life of South Korea. But is the end, it is one Korea. With the Actor Map of Korea (see below), which is a representation of data accumulated from the world wide web, territory disappears for a new temporality. Links between nods of actors – both North and South Korean – show codependency. It is about a network setup that is not physical but still implies a shared spatiality. Finally, Minsuk Cho engages the Korean Peninsula. He talks about different projects for the DMZ (Korean Demilitarized Zone), with a few crazy ones. This territory of division should be occupied (as opposed to the current no man’s land) if we want to join the two parts of Korea. He then compares Korean situation with what happened in Germany. A book about both sides architecture has just been published, 14yrs after the fall of the wall separating West and East Germany. 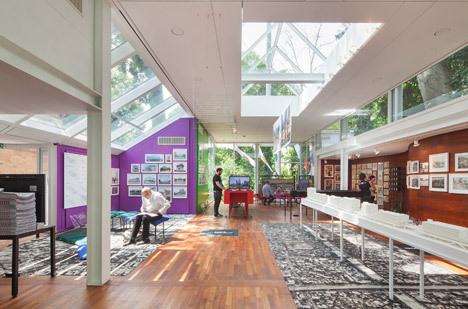 So maybe it was too ambitious to think that this Korean Pavilion for the 2014 Venice Biennale of Architecture could talk about North and South Korea! To see more, visit the Crow’s Eye View exhibit, at Tina Kim Gallery in Chelsea.